The Childcare Resource and Research Unit has periodically assembled Canadian data to produce a national snapshot of early childhood care and education. The seventh edition of Early childhood education and care in Canada presents 2005 and 2006 data. These data - together with data compiled for earlier editions - 1992, 1995, 1998, 2001 and 2004 reveal trends in ECEC over a decade and a half. See this list for earlier versions of ECEC in Canada. Early Childhood Education and Care in Canada 2006 provides cross-Canada data and information on regulated child care and kindergarten by province/ territory, maternity and parental leave together with relevant demographic information. Provincial/territorial profiles on regulated child care include: varieties of ECEC services; number of spaces; standards and regulations; service monitoring and enforcement; funding; history; and recent developments. "The Big Picture" section presents cross-Canada table compilations of material topic-by-topic. "The Long View" presents longitudinal cross-Canada tables of information on child care since the early 1990s. "Looking Beyond Our Borders" is a new section added in this edition; it uses international data and information to put Canada's ECEC in international context. The report also includes a history of Canadian ECEC, an examination of the current state of ECEC, federal ECEC programs including federal transfer payments to provinces/territories, Aboriginal ECEC, further readings and key websites. Childcare Resource and Research Unit, December 2007, 12pp. This publication presents a summary and analysis of the data and identifies key trends. Includes illustrative charts and graphs. See the 8th edition, released June 2009, for the most recent data. 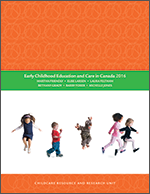 The full text of ECEC in Canada 2006 is available in pdf format from the links below.